Rimmel and Romeo. The nerd and the jock. An awkward alliance that pushes them both way outside their comfort zone. How will love fit anywhere? 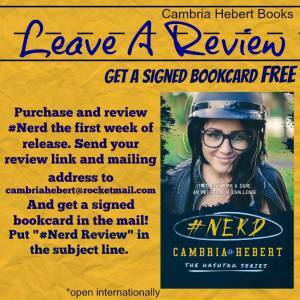 #Nerd by Cambria Hebert is a New Adult contemporary romance that as of today is up for grabs on Amazon! If you’re in the US, make sure you enter the rafflecopter for a #Nerd swag bag and a signed paperback copy of the book. Scroll down for more details on the book, a video of the author reading a chapter, as well as an awesome slow cooker #nerd apple cider recipe! Is that a loaded book blitz post or what? This tour was brought to you by Xpresso Book Tours.